The common priest and the high priest of Israel both represent the Messiah and His roles. God uses them to communicate the process of salvation to be accomplished by the Messiah to the literal-thinking ancients. The priest is a common man from the tribe of Levi, just as the Messiah will be human through His incarnation. Priests are set apart for holy service to the Lord, just as the Messiah’s holy service will bring about salvation. Common priests are first clothed with linen trousers or undergarments that reach from the waist to the knee. A one-piece linen tunic is worn over the trousers, covering his entire body from the neck to feet. The robe has long sleeves that reach to the wrists—just as the white, one-piece linen robe the Messiah will wear. The priest wears a sash or girdle of white twined linen around his waist, and a white cone-shaped linen turban on his head. Its color represents the purity needed to serve in the tabernacle. The common priest’s work corresponds to the Messiah’ work on earth. He’s the spiritual leader serving as intermediary between sinners and God—just as the Messiah will be the intermediary between sinners and God. The priest’s religious rituals deal with sacrifices and offerings that portray forgiveness for sin, and its transfer from the sinner to the sanctuary. In turn, the Messiah will pay the penalty for sin and forgive the sinner, transferring his sins to the heavenly sanctuary. The priests teach the people God’s statutes, judgments, and His Law, while the Messiah will teach the principles of God’s kingdom. The priests also teach how to live healthfully, avoid disease, and have a long life—while the Messiah will heal the sick and provide eternal life. The high priest represents what the Messiah will do in Heaven, as the intermediary between sinners and God in the final eradication of sin. His colored clothing and duties portray the roles of the Messiah in completing the Plan of Redemption. Many of the high priest’s garments are similar to those of the common priest. However, his unique robe is the foundational garment. Fringed with small golden bells alternated with pomegranate-shaped tassels of blue, purple, and scarlet, this sleeveless blue garment of seamless linen represents Heaven. 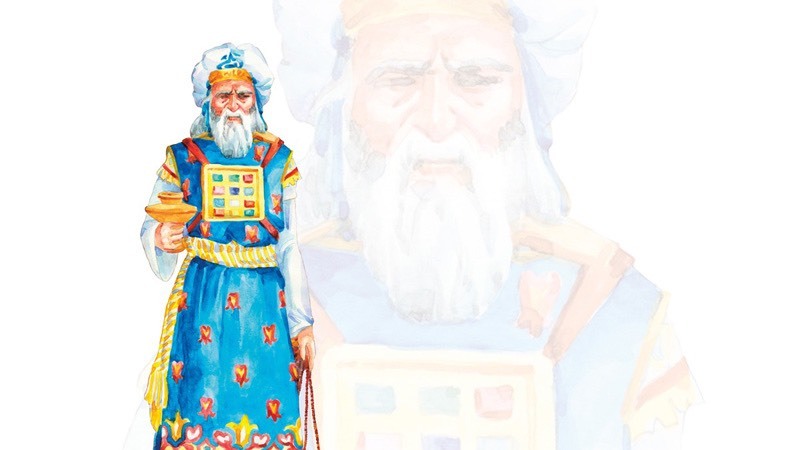 Over his robe is the most sacred ephod—a two-part vest covering the chest and back. On each shoulder is an onyx stone engraved with the names of the twelve tribes. The ephod is made of fine linen with gold thread, and blue, purple, and scarlet yarns. Gold represents the Messiah’s kingly role, blue represents His heavenly role, purple represents His royal role, and scarlet represents His sacrificial role. Wrapped around the ephod is a girdle or sash with the same colors of the ephod. The breastplate, containing twelve gems engraved with each of the names of the tribes, is placed over the priest’s heart. This depicts how much the Messiah loves His people. This breastplate is square, and perhaps hollow in form, depicting the twelve tribes encamp around the tabernacle in the wilderness. On the high priest’s head is a linen turban, or miter, from which hangs a golden plate engraved with HOLINESS TO THE LORD. Clearly the high priest is set apart to the Lord, just as the Messiah is set apart in the heavenly realm as the divine/human Redeemer of mankind. The supreme function of the high priest is to perform the ritual cleansing of the earthly sanctuary. Meanwhile, the Messiah in His ministry will actually cleanse the heavenly sanctuary by eradicating sin from the universe, once and for all.